Located 1 km from Palolem Beach in the Canacona district of South Goa, The Fern Gardenia Resort offers eco-friendly wooden cottages. Offering free Wi-Fi, it features an outdoor pool and spa. 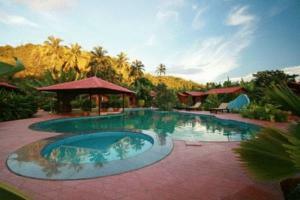 Fern Gardenia’s air-conditioned cottages are surrounded by tropical greenery. Each room has a flat-screen cable TV, safety deposit box and tea/coffee making facilities. The private bathrooms have a glass-enclosed hot/cold shower. Guests can relax on a sun lounger by the pool. The front desk and concierge cater to guests’ needs 24 hours a day. Laundry and dry cleaning services are also provided. Azolla Multi-Cuisine Restaurant serves a variety of Indian and Western dishes, including sandwiches and steaks. Drinks can be enjoyed at the pool bar. Room service is available 24 hours. The Fern Gardenia Resort is 1.6 km from the nearest bus station and 2 km from the Canacona Railway Station. It is 60 km south of Dabolim Airport. Free! Wireless Internet Hotspot is available in the entire hotel and is free of charge. Free! All children under 8 years stay free of charge when using existing beds. One older child or adult is charged INR 1133 per night and person in an extra bed. Maximum capacity of extra beds in a room is 1. There is no capacity for cots in the room. Any type of extra bed or child's cot/crib is upon request and needs to be confirmed by the hotel. Supplements will not be calculated automatically in the total costs and have to be paid separately in the hotel.